You are here: Home > Media > Blog > Inequality has reached a 30-year low. So should we still care? Inequality has reached a 30-year low. So should we still care? The joke goes that in the pub quizzes of the future, the answer to every question that starts “in what year…” will be 2016. But it’s likely that few will correctly identify that 2016 was also the year in which household income inequality fell to its lowest post-Thatcher level. Yet, thanks to a combination of strong employment growth, low inflation and rising pensioner incomes in recent years, that is precisely what we see in new data released by the ONS today. 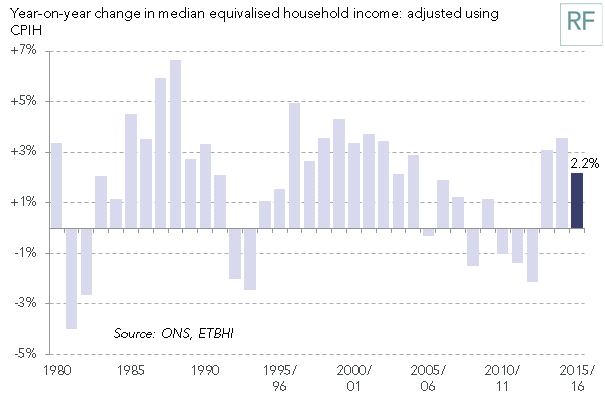 Overall, typical household incomes grew by 2.2 per cent in the financial year 2015/16 after accounting for inflation. That’s a little lower than had been expected, but still represents another solid year for living standards, as shown in the chart below. 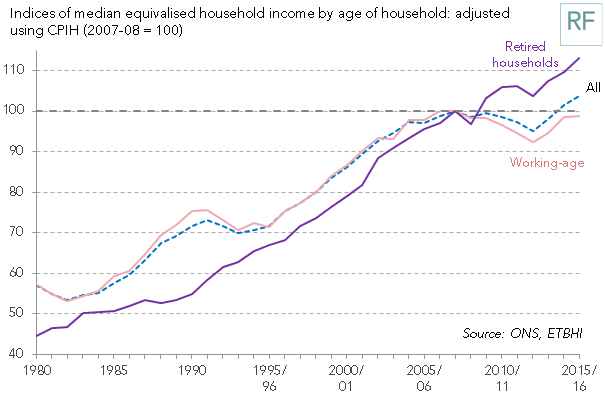 Particularly worthy of note is the fact that lower income households fared especially well last year. Typical incomes among the poorest fifth of households rose by 5.1 per cent, in sharp contrast to a 1.9 per cent reduction in typical incomes among the richest fifth. The year-on-year figures tend to be a bit volatile (especially at the top of the income distribution), but a similar pattern has held for a number of years. It reflects two key things; the impressive gains in employment made since 2012 have been particularly beneficial for lower income households, while poor performance on pay has tended to hit hardest as we move up the earnings scale. It is also a product of the fact that pensioner households (who tend to have lower than average incomes) have fared better than working-age ones in recent years. The result, as the next chart shows, is that that Gini measure of inequality suggests that the UK is back to where it was in 1986. That’s still high by international standards though. It’s also worth noting that these figures are lower than those recorded in the much larger Family Resources Survey and that the picture looks less good if we add in housing costs (something we’ll look at again in our annual living standards publication next month). However, the positive direction of travel is clear. So if incomes are up and inequality is down, why isn’t the UK experiencing more of a feel good factor? A large part of the answer stems from the next chart. It shows the average annual growth recorded in different periods at different points of the income distribution. 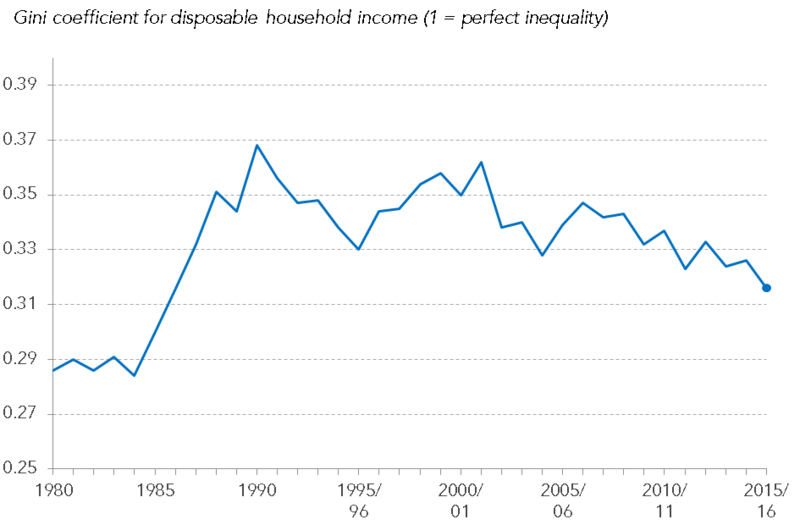 The sharp growth in inequality of the 1980s is clear to see, with income growth getting stronger as we move up the distribution: from 0.8 per cent a year among the poorest fifth of households to a huge 4.4 per cent a year among the richest fifth. In contrast, the period between 1990 and the financial crisis delivered growth that was strong and evenly shared. Now consider the post-crisis period: yes the pattern of growth is inequality-reducing, but it is much weaker than the growth we’ve been used to in previous times. This picture chimes with our analysis of the Brexit vote. Alongside demographic and cultural factors, we found that economic considerations played into the likelihood of a Leave vote across different local authorities. But this was driven not by variations in recent economic experience but instead by historic divides. Put simply, there’s little comfort to be taken in the fact that inequality has narrowed when everyone is feeling that their living standards expectations aren’t being met. And we are facing some potential new divides, as reinforced by today’s figures. The next chart shows that typical incomes among pensioners have risen by 13 per cent since 2007-08, whereas they remain 1.2 per cent below their pre-crisis level among working-age households. Note too that there was very little year-on-year change among the latter group: reporting of the headline improvement in living standards is likely to jar for many working-age households. 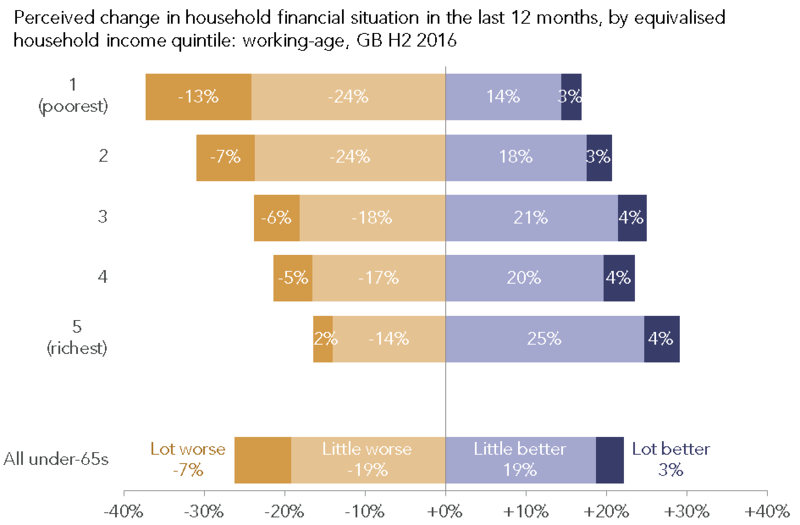 Indeed, as the recent NMG Survey for the Bank of England shows, more working-age households think their financial situation got worse rather than better last year. 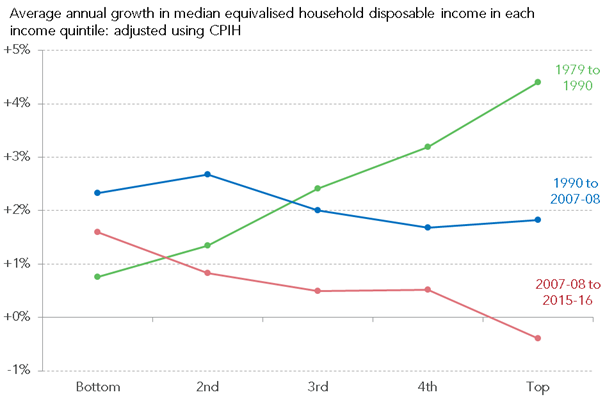 And, contrary to discussion above, the picture looks worse for lower income households. Two things are likely to be at play here. First, any given financial pressure is likely to be felt hardest for those with already restricted incomes. Second, positions in the income distribution aren’t fixed: those at the bottom this year may well have been higher up last year. So the picture is more complex than today’s welcome living standards headline might suggest, but why do I say that the answer to the inequality quiz question of the future will be 2016? Why not 2017 or some other date? We can’t be sure of course but, as we’ve discussed before, there are good reasons for supposing that we face new headwinds in the coming years. The three biggest drivers of income growth are employment, pay and state support – and there is cause for concern on each of these fronts. While our jobs record has been remarkable in recent years – and while we should continue to aim for more – it’s hard to see how we can enjoy the same scale of income gains from ever-higher employment in the coming years as we have in the past few. On pay, we are faced with projections for both sluggish nominal pay growth (with the OBR revising down its assumption for trend growth in light of both the poor performance of productivity post-crisis and concerns over Brexit) and higher inflation (as a result of the sharp decline in the value of sterling following the EU referendum. In relation to state support, government plans for significant cuts in working-age welfare spending point not just to lower incomes – but to a concentration of the pain on those in the bottom half of the distribution. The upshot is that we face the prospect of something we’ve not seen in recent decades over the next five years: income growth that is simultaneously low (like in the post-crisis period) and regressive (like in the 1980s). We must hope that this proves to be a Michael Fish moment in reverse: predicting a storm that doesn’t arrive. But amid today’s sunny news on living standards, the clouds on the horizon are all too visible.